Perfect for peeling carrots, apples, potatoes and many more tasty ingredients to add to your dishes, the smart design of this Progress peeler features both a serrated and straight blade. 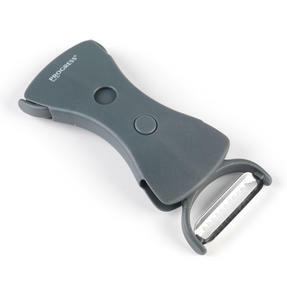 Brilliantly compact for simple storage and added safety, the peeler has an easy press button function to select which blade you want to use. Made with strong stainless steel for outstanding quality and hygiene – simply wipe the peeler clean with warm, soapy water or place it in the dishwasher for easy clean up. With this Progress peeler you can prepare a variety of ingredients to add to delicious meals for your friends and family to enjoy. 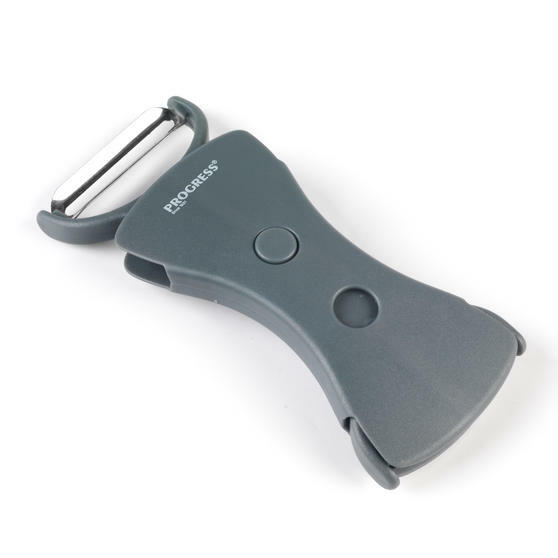 Measuring at 13.9 x 9 x 2.5 cm, the double ended peeler is conveniently compact and takes up minimal storage space in your kitchen. Completely dishwasher safe, the device is incredibly easy to clean, or you can simply wipe away any leftover food with soapy water. With an ergonomic and practical design, the peeler has both a straight and serrated blade for all of your food preparation needs. Made from brilliantly durable stainless steel, the blades will effortlessly glide over your fresh ingredients as you peel them.